The eclectic collection spread on the table in front of Anne "Lulu" Weiland sparkles and glows in the late afternoon sunshine: a vinyl shard of a record, beaded scraps of bright fabric, a chunk of glued and glittered puzzle pieces, tiny books and miniature watercolor paintings. Like a baseball or Pokémon card collection, these kaleidoscopic odds and ends fill page after page of transparent trading card sleeves inside a three-ring binder. Yet, unlike even the rarest collectible trading card, this micro-art — called artist trading cards — is truly one of a kind. Produced by hand, no card produced with the intent to trade can be the exact replica of another (with the exception of limited edition, numbered series). 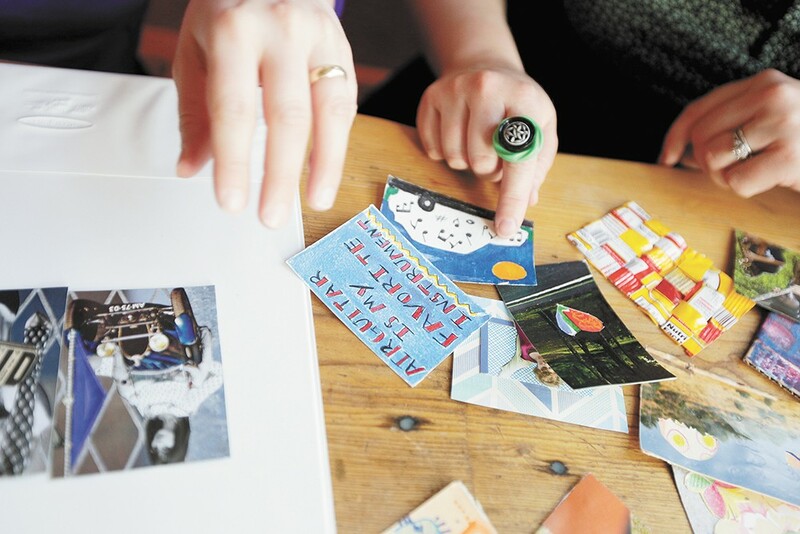 In a movement born almost 20 years ago in Zurich, Switzerland, dozens of groups who meet regularly to trade the 2½-by-3½-inch artist trading cards (ATCs) have since formed in cities around the world. The concept is simple. The purpose is to use art as a great equalizer. Anyone can make their own trading cards from whatever materials they choose; the only restraint is the small dimensions. "The guy who started it in Switzerland is a famous artist [M. Vänçi Stirnemann] who does performance art," Weiland explains. "It's supposed to level the playing field because you get people who aren't knowledgeable about art who are creating it, and then you also get artists who are showing their work in galleries." Weiland, who creates under the artistic moniker Lulu Ludlum, got hooked on artist trading cards back in Portland, where she and her husband lived before moving to Spokane in the summer of 2014. 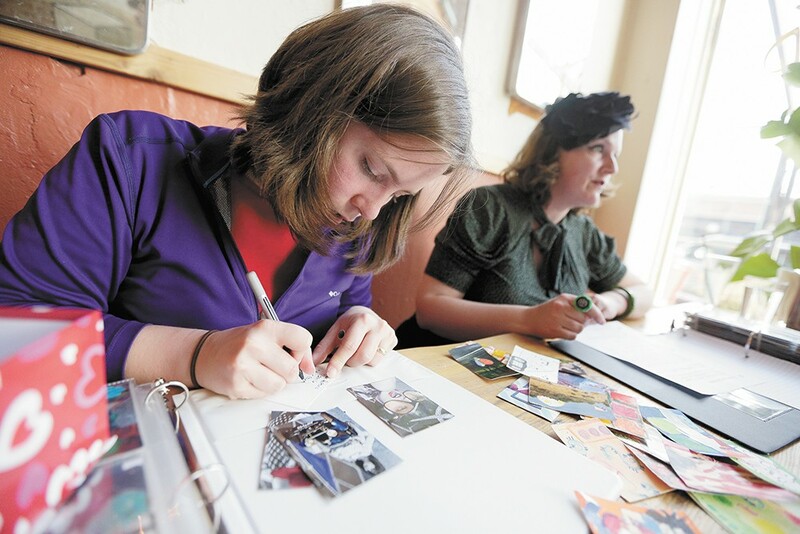 In the Rose City, she ran the Portland Artist Trading Card group for several years, organizing meetups and workshops. After settling into their new Spokane home, Weiland hosted the first Spokane ATC event in January 2015. About a dozen people, including several local professional artists, turned out for the meetup. Monthly Spokane ATC gatherings are held the last Wednesday of the month, from 5:30-7 pm, at Boots Bakery & Lounge downtown. On this particularly pleasant, late March evening, only three people including Weiland have turned out. Usually the group averages about seven people each month, mostly regulars; she wishes it was more consistently attended. Workshops teaching how to make artist trading cards have helped spread the word some; the next session for adults to learn about and make ATCs is set for Saturday, May 21. "People get really excited when they see these, but they're intimidated and they don't know where to start, so it's good to go to those workshops," Weiland notes. "What happens is that people create them and they get the bug and they just want to keep going." Diminutive, original works of art. But making artist trading cards doesn't have to be time-consuming — just a few hours here and there, depending on the medium. "It's an accessible, easy way to make art because it doesn't take the commitment of a giant canvas looming before you," Weiland says. "You can upcycle things, or use your archaeology magazine or whatever else you get in the mail." Her preferred art process is collage, using vintage magazines and other ephemera she's collected. While many artist cut their own card backs or use materials like playing cards to paint, draw or glue onto, Weiland usually cuts apart a cereal box. Then she collages the full sheet, trimming the final piece into ATC dimensions to create nine individual cards. Guidelines for artist trading cards are so loose that even a wire sculpture following the required dimensions is acceptable, as are three-dimensional objects that have a 2½-by-3½-inch base. While those who haven't made their own art cards to trade are welcome to attend any of Spokane ATC's events to see what it's all about, proper etiquette is to trade your own card for another artist's work. If someone else asks to swap art, it's also implied that you agree to trade with them, no matter the artistic skill difference. Over the years, artist trading cards' growing popularity has led to the creation a sizable online community of hobbyists and professionals who trade cards by mail, hosting themed swaps and various other events. Now, after more than a year hosting ATC events here, Weiland believes that Spokane's rising arts community can continue to support and help grow the local ATC movement she's working to establish here.